A 13-year-old male child reported to our outpatient department with multiple missing teeth and treated bilateral cleft lip and palate [Figure 1]. Patient was second child of consanguineous healthy parents, born at term by vaginal delivery following a normal pregnancy with no history of any complications during pregnancy. After birth bilateral cleft lip and palate, syndactyly of hands and feet, enlarged hydronephrotic left kidney, and dilated left ureter were seen. 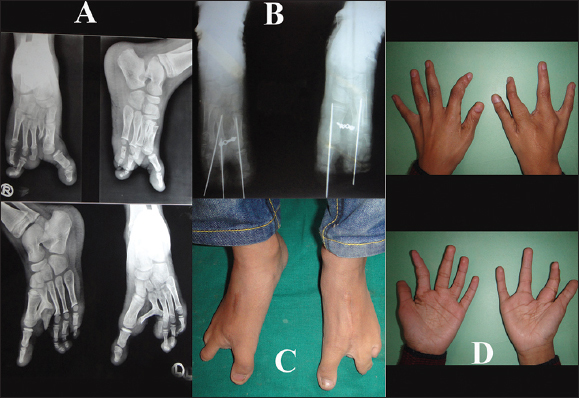 On clinical examination, an average height to weight ratio of 56 inch and 81.57 pound and syndactyly of both hands and feet [Figure 2] were seen with history of surgical release of syndactyly of hands at the age of 1-year and feet at the age of 10 years. Extraoral examination [Figure 1] shows dolichocephalic head; asymmetric, leptoprosopic, hyperdivergent face with straight profile; hypertelorism; obtuse nasolabial angle and shallow mentolabial sulcus; competent lips with scar seen bilaterally on upper lip with the history operated bilateral cleft lip at the age of 3 months and wide nasal base with depressed nasal tip. Intraoral examination [Figure 3] shows operated cleft palate with history of repair at the age of 18 months; multiple missing teeth, enamel hypoplasia, multiple restored teeth; dentoalveolar angle class III malocclusion with complete anterior and posterior crossbite (Baru's classification score 5) and anterior deep bite of 5 mm. Past dental history of rampant caries in all deciduous teeth at the age if 5 years [Figure 4] was present. Extraction of all primary teeth except lower anteriors had to be done under general anesthesia due to Frankel's definitively negative behavior scale. Patient underwent cystoscopy and urethral dilation under GA at 12 years of age due to recurrent urinary tract obstruction. 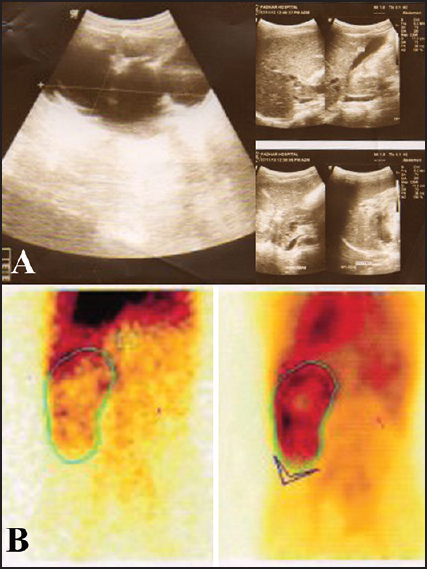 Investigations like computed tomography urogram [Figure 5], ultrasonography abdomen and dynamic renal scintigraphy (99mTc-DTPA) [Figure 6] revealed severe left hydroureteronephrosis extending up to distal ureter with obstructive nephropathy and torturous dilated ureter up to ureterovesical junction and shows partial tracer stasis upto 1 h and right renal agenesis. 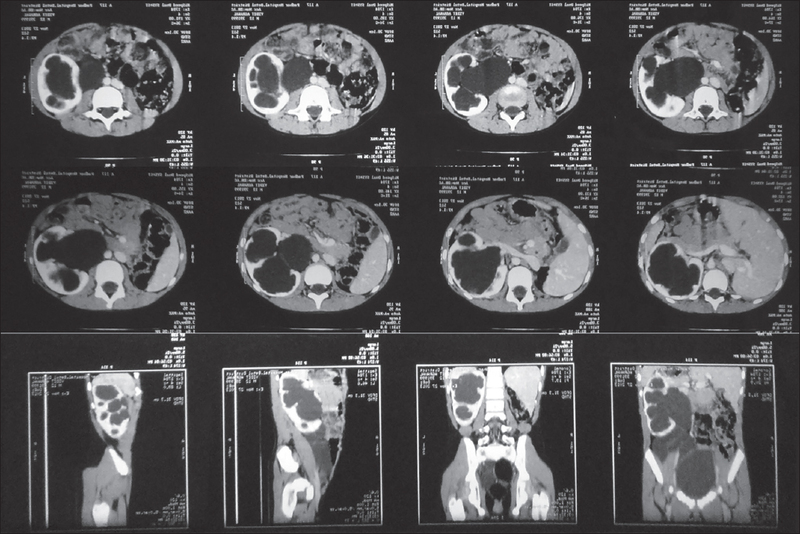 Current investigations like orthopantomogram, maxillary occlusal radiograph, and lateral and posteroanterior cephalograms are shown in [Figure 7] and [Figure 8]. Craniofacial anomalies are a diverse and complex set of conditions which include isolated and multiple anomalies of genetic or nongenetic origin and are characterized by changes in the structure of the skull and/or face. The findings of our case are compatible with the diagnosis of Fraser syndrome according to the diagnostic criteria proposed by Thomas et al. given in [Table 1]. The presence of two major criteria and one minor criterion or one major and at least four minor criteria were required for the diagnosis of Fraser syndrome. Table 1: Diagnostic criteria by Thomas et al. In our case the features of hypertelorism, syndactyly of hands and feet, bilateral cleft lip and palate, right renal agenesis, left renal hydronephrosis, and normal height weight ratio are suggestive of Fraser syndrome without cryptophthalmos. The unique features of this case are the age of patient, the absence of cryptophthalmos and no mental retardation. There is a great variation in possible malformation of Fraser syndrome. So the diagnosis should be confirmed strictly adhering to the diagnostic criteria of Fraser syndrome. For managing such cases, the prime concern is overall health of the patient followed by functional stability and the esthetics. Which can be achieved by surgical correction of cleft lip and palate; expansion of maxillary arch; orthodontic decompensation followed by orthognathic surgery involving mandibular setback along with implant placement and prosthetic replacement of multiple missing teeth to achieve functional stability and esthetic harmony. Francannet C, Lefrançois P, Dechelotte P, Robert E, Malpuech G, Robert JM. Fraser syndrome with renal agenesis in two consanguineous Turkish families. Am J Med Genet 1990;36: 477-9. 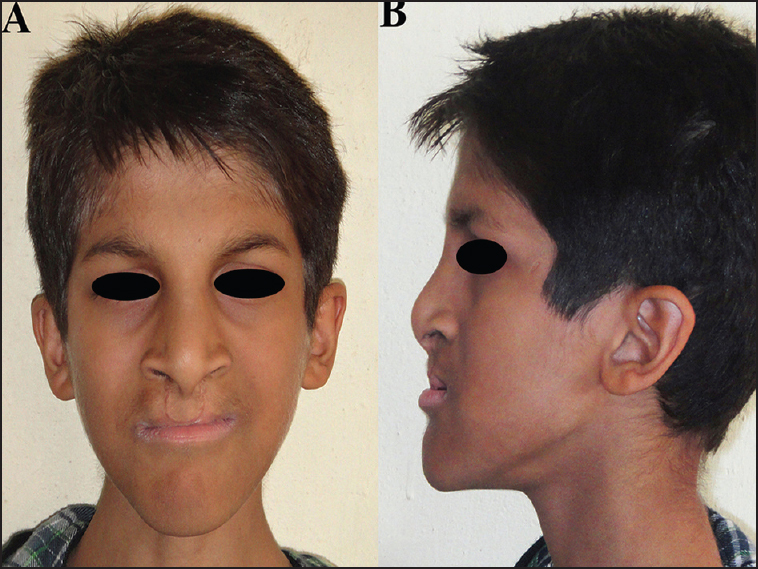 Khoury E, Golalipour MJ, Haidary K, Adidi B. Fraser or cryptophthalmos syndrome: A case report. Arch Iran Med 2004;7:307-9. Thomas IT, Frias JL, Felix V, Sanchez de Leon L, Hernandez RA, Jones MC. Isolated and syndromic cryptophthalmos. Am J Med Genet 1986;25:85-98. Narang M, Kumar M, Shah D. Fraser-cryptophthalmos syndrome with colonic atresia. Indian J Pediatr 2008;75:189-91. Kiyozumi D, Sugimoto N, Sekiguchi K. Breakdown of the reciprocal stabilization of QBRICK/Frem1, Fras1, and Frem2 at the basement membrane provokes Fraser syndrome-like defects. Proc Natl Acad Sci U S A 2006;103:11981-6.
van Haelst MM, Scambler PJ; Fraser Syndrome Collaboration Group, Hennekam RC. Fraser syndrome: A clinical study of 59 cases and evaluation of diagnostic criteria. Am J Med Genet A 2007;143A:3194-203. Slavotinek AM, Tifft CJ. Fraser syndrome and cryptophthalmos: Review of the diagnostic criteria and evidence for phenotypic modules in complex malformation syndromes. J Med Genet 2002;39:623-33. Ramsing M, Rehder H, Holzgreve W, Meinecke P, Lenz W. Fraser syndrome (cryptophthalmos with syndactyly) in the fetus and newborn. Clin Genet 1990;37:84-96. Schauer GM, Dunn LK, Godmilow L, Eagle RC Jr, Knisely AS. Prenatal diagnosis of Fraser syndrome at 18.5 weeks gestation, with autopsy findings at 19 weeks. Am J Med Genet 1990;37: 583-91. Jones KJ. 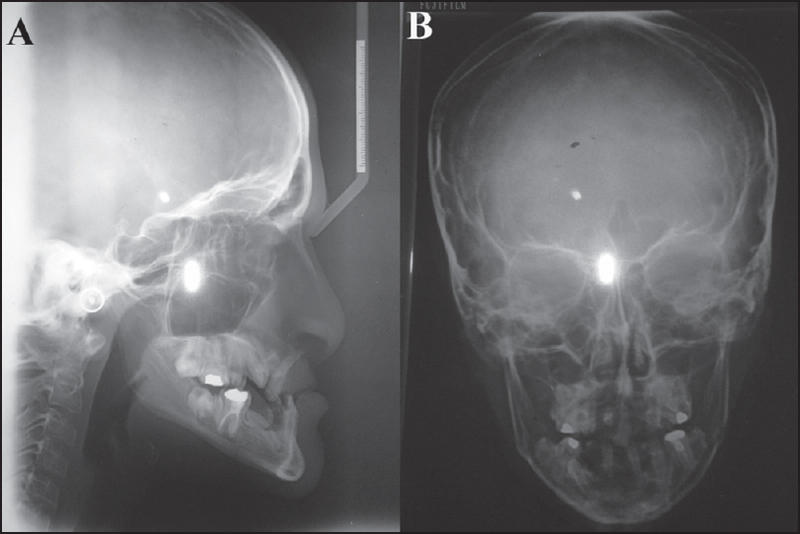 Smith′s Recognizable Pattern of Human Malformations. 5 th ed. Philadelphia: W.B. Saunders co.; 1999. p. 242-4.